New Block – Georgia Guidestones: “2014″ – Mystery Illness Spreads To 30 States- Coincidence? Home / 2014 / September / 24 / New Block – Georgia Guidestones: “2014″ – Mystery Illness Spreads To 30 States- Coincidence? Is it just a coincidence that just as a supposedly “rare” virus spreads across America like a plague, attacking only a specific group of individuals, namely children, at the same time that Ebola is killing thousands across west Africa, on top of newly discovered vials of multiple pathogens, including smallpox has been discovered, and that the date 2014 has now been added to the much-talked about Georgia Guidestones. Does this mean the depopulation agenda has been determined by whoever is responsible for the addition, to kick into high gear now, in 2014? Well let us take a look at what else has been happening in the United States and across the world. From mid-August to September 23, 2014, a total of 213 people from 30 states were confirmed to have respiratory illness caused by EV-D68. The 30 states are Alabama, Arkansas, California, Colorado, Connecticut, District of Columbia, Georgia, Illinois, Indiana, Iowa, Kansas, Kentucky, Louisiana, Massachusetts, Michigan, Minnesota, Mississippi, Missouri, Montana, Nebraska, New Jersey, New York, North Carolina, North Dakota, Oklahoma, Pennsylvania, Virginia, Utah, Washington, and West Virginia. The cases of EV-D68 infection were confirmed by the CDC or state public health laboratories that notified CDC. So far, all the cases have been among children, except for one adult. trong>Also in 2014, we have a scientist from a bio lab admitting that Ebola, Plgue, Anthrax and much more could “easily” be spread (2nd video below), a number of deadly pathogens, viruses and diseases, including smallpox, discovered in labs in America, confirmation that biogenetic weaponry aka genetic bombs not only exist but have been experimented on, a laptop obtained from a terrorist group with documentation detailing the creation of a bubonic plague bomb, along with a dated warning from a Russian defector about the creation of biological weaponry and hybrids, including Ebola-Pox. We also now know tht the CDC owns the patent on the Ebola virus and any associated hybrid with a 70 percent commonality, the NIH owns any vaccines created to battle Ebola or any hybrids, diseases the US has basically eradicated in America resurfacing after a wave of illegal immigrants were brought in a spread out through all 50 states, with a “new wave” expected imminently. All in the year 2014, coincidentally the same year that has ominously been added to the Georgia Guidestones. More on who created the Georgia Guidestones, which fits in with the “theory” that a group of individuals, some call them the Illuminati, the NWO, some claim they are pushing a Luciferian agenda and many in the mainstream media consider it all a “conspiracy theory,” but the description itself, the story behind the Guidestones verifies conclusively that a mystery “group,” is behind stones and the message contained on them. 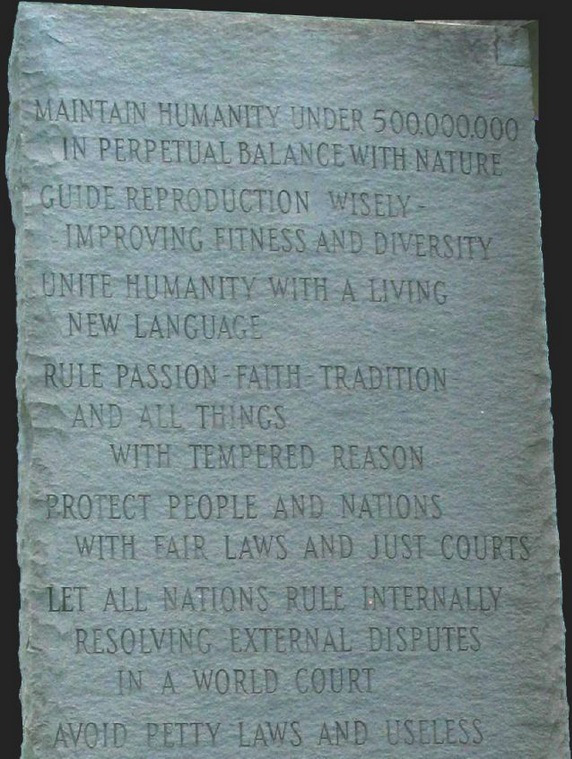 So the question remains, is all that is happening in 2014, along with this new addition to the Georgia Guidestones, all coincidence? Or has the depopulation agenda, the great culling, that has been considered a conspiracy theory for so long, begun in full force? Sign Up To The All News PipeLine Newsletter!